Rishi Kapoor once again took a dig at Anurag Basu for delivering a flop, Jagga Jasoos which starred Ranbir Kapoor in the lead role. He indirectly called the filmmaker a 'monkey' who goes berserk after seeing a new toy. Have you seen these photos of Malaika Arora, Vicky Kaushal and Sonakshi Sinha? Rishi Kapoor calls Anurag Kashyap and Anurag Basu ‘monkeys’ at Neha Dhupia’s talk show, No Filter Neha. Rishi Kapoor is the guest on the latest episode of Neha Dhupia’s talk show No Filter Neha and as expected the actor made some unapologetic comments on the young generation of Bollywood and on the two ‘Anurags’ of Bollywood. As Neha asked Rishi to take up the Just A Minute game and his topic was ‘Anurag’. For those who don’t know, Anurag Kashyap directed Ranbir Kapoor in Bombay Velvet which tanked at the box office and Anurag Basu recently failed to attract audience to the theatres with Jagga Jasoos which was co-produced by Ranbir. “This fashion-conscious generation goes for the ‘Chautha’ which takes place in an air-conditioned hall. It is an occasion for them to wear their whites and beige clothes and wear dark glasses. Chautha looks have become similar to airport looks for these actors,” added the Amar Akbar Anthony star. Ranbir is very obliging and kind which I don’t like at all. He can’t say no. He has so much patience. He will bloody miss his flight but will not deny a selfie to a fan. And I am so irritated when someone asks me for a selfie. I just can’t take it and I get unnerved when the person is searching for the button to click the photo. I tweet for myself and not for others. People mistake it for a personal comment. I can’t be right always. Raj Kapoor is an enigma. Today we are realising the grandeur of his name. 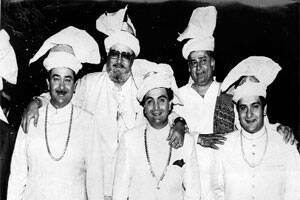 Raj Kapoor is someone who is known to today’s youth. The young generation still sings songs from Raj Kapoor’s movies in various nations. People are talking about him even after 29 years of his death instead of talking about Ranbir, Karisma or Kareena. We didn’t know in our younger days that he is such a phenomenon. Raj Kapoor is my guru, He means everything to me. He was not a tough taskmaster as a father but as a filmmaker, he was a monster at times. He had this thinking that treat the crew and the actors like your son-in-law but when it comes to work, he said take work from them like a ‘kasaai’. He never compromised with his work. It is this passion which Ranbir has imbibed from his grandfather. We are always consumed with food conversations. At breakfast, we discuss what we’ll have for lunch and at lunch we discuss dinner. We relish discussing food. Everything has become digitalised. The whole pattern has changed. Now the directors want a shot from every angle and the actors are being screwed in the bargain. I am spontaneous and I am not a method actor and it becomes really difficult to portray the same emotion in the same way from every angle. Otherwise, the young kids are terrific. I am having great fun filming with young directors and new thinkers. 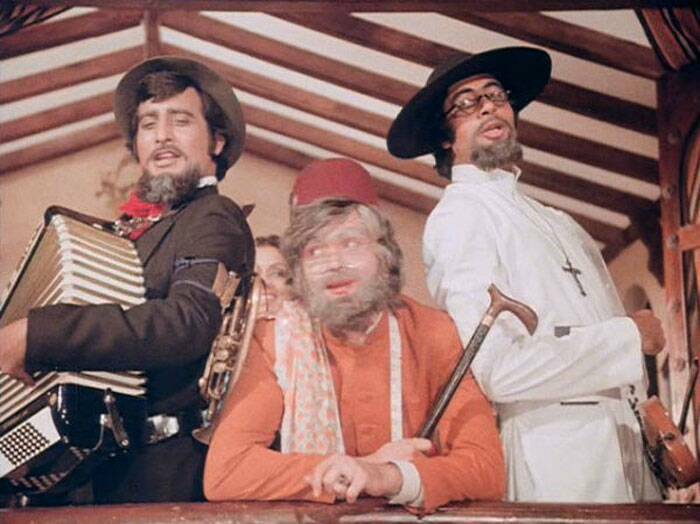 January 1 to January 21 was scheduled for filming the climax of Amar Akbar Anthony. At that time, all of us were working in double and triple shifts, me, Amit Ji, Vinod, Shabana Ji, Pran Sahab, Jeewan Sahab all were on the high of their career. And Manmohan Ji was not completing the shoot. So, he and my secretary had a dispute regarding my dates as I was doing a movie called Anjaane Mei with Neetu. For that, I had to leave for Delhi as we had the permission to shoot on the Republic Day rehearsals on January 23. Manmohan Ji used to threaten that I will remove Rishi Kapoor’s part from the climax and watch them fight had all of us laughing. Finally, I had to deprive Manmohan Ji of my presence and I went to Delhi. But when I came back Manmohan Desai gave me an accordion and bongos and asked me to sit on the top couch and play it. Then, I was angry that what is he making me do but after the movie released it became a high point in the climax of the movie. Two brothers were taking down the bad guys and I was playing music. So what people enjoy today was never planned. It was because I was not unavailable.